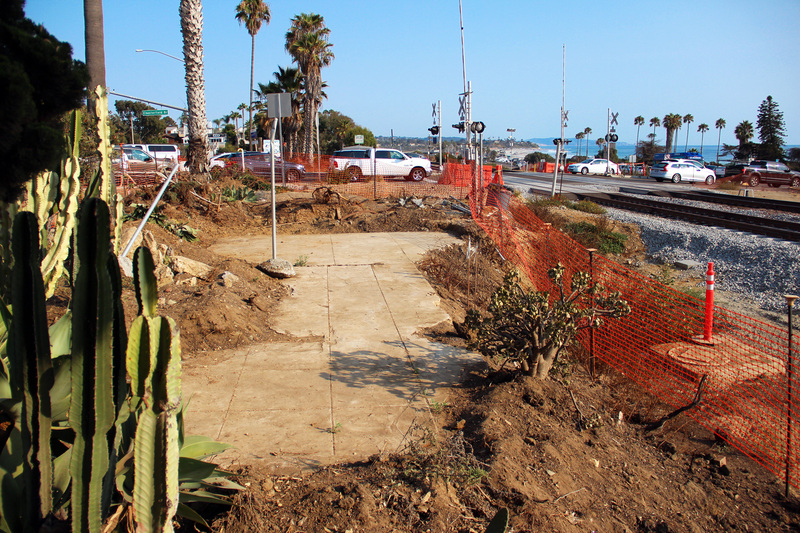 Construction of our new Coastal Rail Trail in Cardiff is well underway, and a surprising find by Encinitas resident and local train historian Ron Dodge has added an exciting dimension to the project. Ron routinely visits the rail corridor construction site in Cardiff, and he recently saw and photographed an unearthed slab of concrete that conscientious SANDAG construction workers had unearthed just minutes before. Ron sent his photos of the object to City Councilmember Tony Kranz, a fellow train buff, wondering if it came from the original 1913 Cardiff train station. In fact it does! You can see the historic train station floor in the photo above, looking south from the east side of the railroad tracks, just north of the Chesterfield Dr. crossing. After a series of collaborative meetings, the original flooring of the train station will be preserved in place, and the rail trail will be re-routed slightly to the east to avoid it. The city will work with Cardiff 101, the Harbaugh Foundation, SANDAG, NCTD, and other interested parties on the next steps. Those buildings were the very first structures built in Cardiff. With signs and historic photos, and recreating some of the original features such as an historic bench, we can tell the story of this bygone era — passengers disembarking at the Cardiff station in the early 1900s right at that spot and spending the night in the Mercantile building, which was originally a hotel, post office and grocery store. What a cool way to incorporate a remnant of our community’s past into our future rail trail! 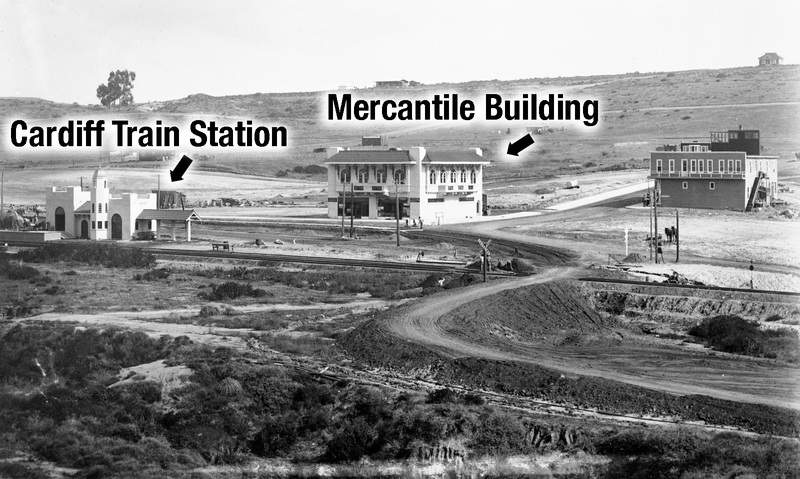 Below is the same location last Friday, over a century later, which gives you a better idea of where the train station was located back in the day. We’re the beneficiaries of a marvelous confluence of good luck and good intentions here – workers preserved the site, local historians identified the remnants, community groups rallied support, local government officials recognized the site’s significance, and technical staff were flexible enough to make requested changes. And all of this at the last minute. Fate must have been in a good mood for a local artifact to be not just recognized, but invited to be part of our future. These two articles in the Coast News and Encinitas Advocate provide more details about the history, and my monthly Coast News column also discusses it. After a very difficult and lengthy process, the City Council this week approved a housing plan for voter approval this November that would allow 1,504 homes to be built on 15 sites distributed across the city. Boy, has this been a tough journey. My vision and promise to you has always been to conduct an inclusive, fair, and transparent procedure that would bring you, the voter, the best possible solution to Encinitas’ longtime lack of housing compliance with the state. For years, Encinitas has been the only city in the county without a state-approved housing element, and it’s costing us dearly in lawsuits, and withheld grant money for major road improvement projects. Not to mention our infamous lack of affordable housing. I ultimately voted “yes” on this housing plan last week because it gives you the right to vote on future housing. If a majority of councilmembers had voted “no” on the plan, we would have taken that right to vote away from residents and put it directly into the hands of a judge. We have a status hearing on our existing housing lawsuits on Aug. 17th, when a judge will confirm that the city has put something on the ballot as we agreed to do. Good governing demands a spirit of compromise. I believe every councilmember had similar feelings. 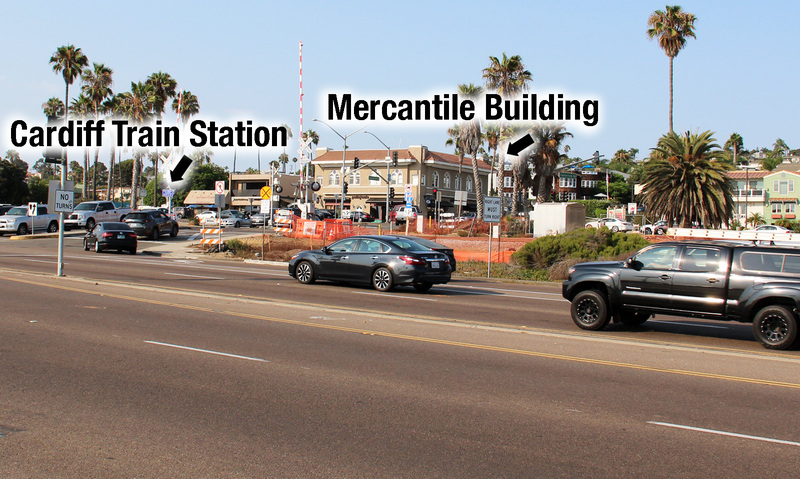 I hope Encinitas residents will vote “yes” on this housing plan. Getting out from under the burden of years of non-compliance will usher in a new era of possibilities for Encinitas. I’m grateful to my colleagues, professional staff and outside experts for all the effort dedicated to get us this far. More information on our decision-making can be found in this Coast News article. And I recommend this excellent Planet Money podcast called “Yes in My Backyard” about housing; it astutely highlights the struggles we’re experiencing. 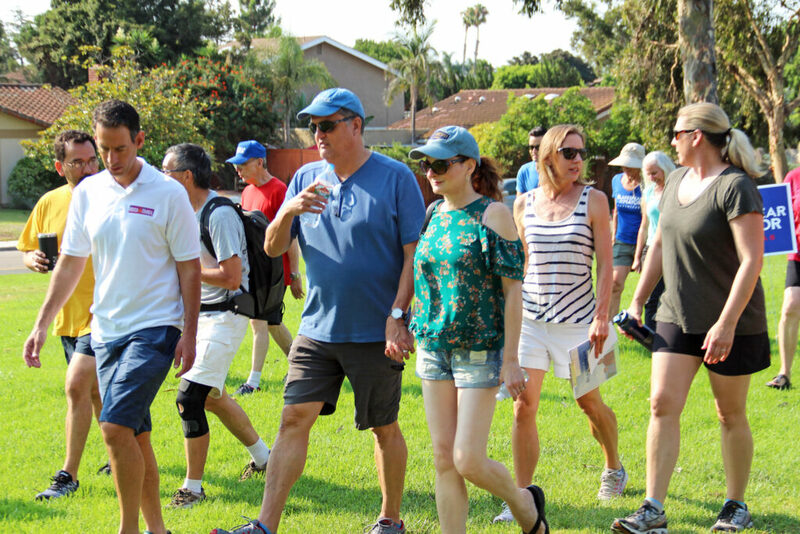 Yesterday morning’s fourth “Walk With the Mayor ” event in Village Park gave District 3 candidate Joe Mosca and me another invigorating chance to meet more of you and discuss your thoughts and concerns while seeing different parts of our city. There’s one person challenging me in my re-election bid for Encinitas Mayor. To my knowledge, I’ve never met or received any communication from John Paul Elliott and I don’t know anything about him or his interests. I welcome him to the race, and I look forward to a positive and productive conversation about our local issues. November’s election will be the first for Encinitas’ new districts. For District 3, which includes Cardiff and parts of New Encinitas, incumbent Mark Muir is being challenged by Planning Commissioner Jody Hubbard. I have enjoyed serving with Mark, who is affable and well-meaning, but I think it’s time for change and I’m supporting Jody for City Council. District 4 includes Olivenhain and parts of New Encinitas. Deputy Mayor Joe Mosca was appointed to the City Council to complete my City Council term when I was elected mayor in 2016. Joe’s running to keep his seat on the council, and is being challenged by former Planning Commissioner Tony Brandenburg, who ran for City Council in 2016 and applied for the council vacancy when Joe was appointed. While I appreciate Tony’s years of service to our community in multiple capacities, I am endorsing Joe to continue his excellent work for Encinitas. Lots of summer fun happening in Encinitas right now! The Blakespears are spending time at our beautiful beaches, as well as attending many community events. 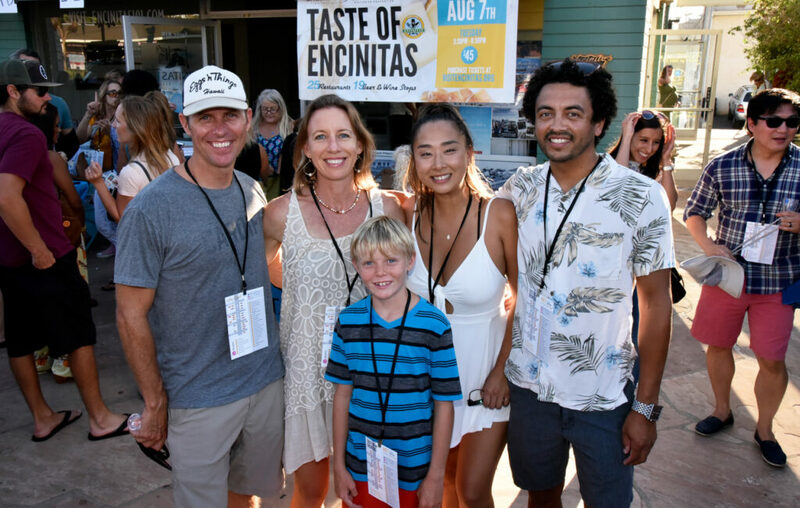 In this photo taken at Taste of Encinitas, we’re enjoying the festivities with Nick Jones (far right), and Irene Pyun, the Executive Director of Encinitas Main Street Association, the organization that masterfully hosts this annual event showcasing many great restaurants. P.S. Congratulations to our Encinitas Environmental Commissioner Ari Novy on his appointment as the new Executive Director of the San Diego Botanic Garden! He’s an outstanding local choice to continue the culture of innovation and excellence that his predecessor Julian Duval has created at the garden for the last 24 years. Ari previously served as the executive director of the U.S. Botanic Garden in Washington D.C. and was the chief scientist at the Leichtag Foundation. Here’s a Coast News story about the transition.